Did I have rose coloured glasses? Or was New Orleans going to be as fabulous as I remembered? 3 years ago we were on culinary cloud nine. 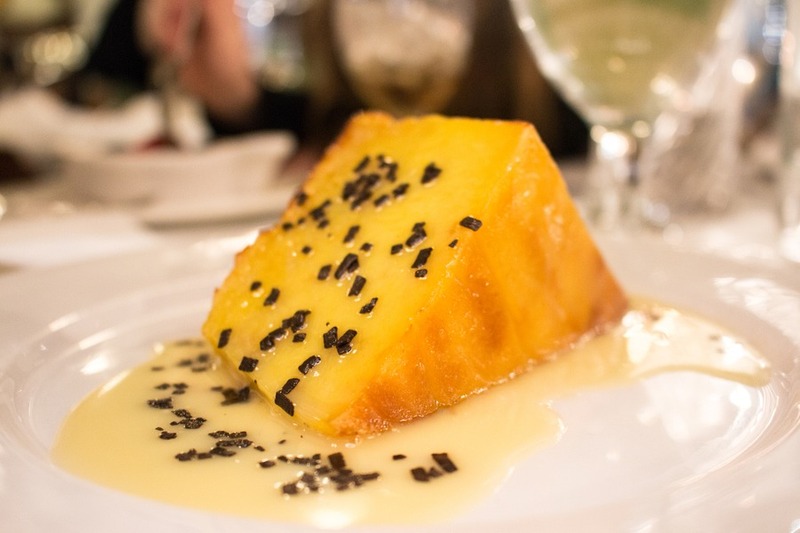 During an incredible 2-week visit, New Orleans never served up one bad meal. 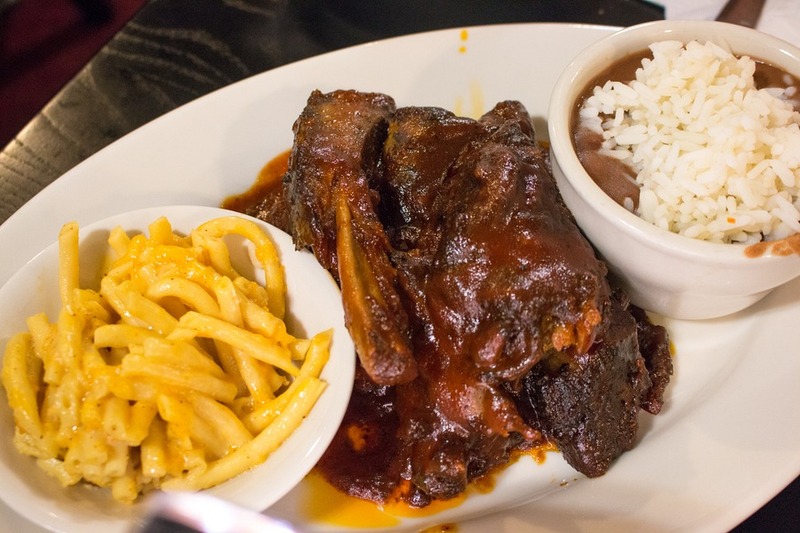 So when New Orleans invited us back to this food-lovers’ paradise we couldn’t resist. Would The Big Easy be able to once again satisfy our avaricious appetites and delight our increasingly proficient palate? While we were tempted to head back to old favourites, we resisted. All except one. 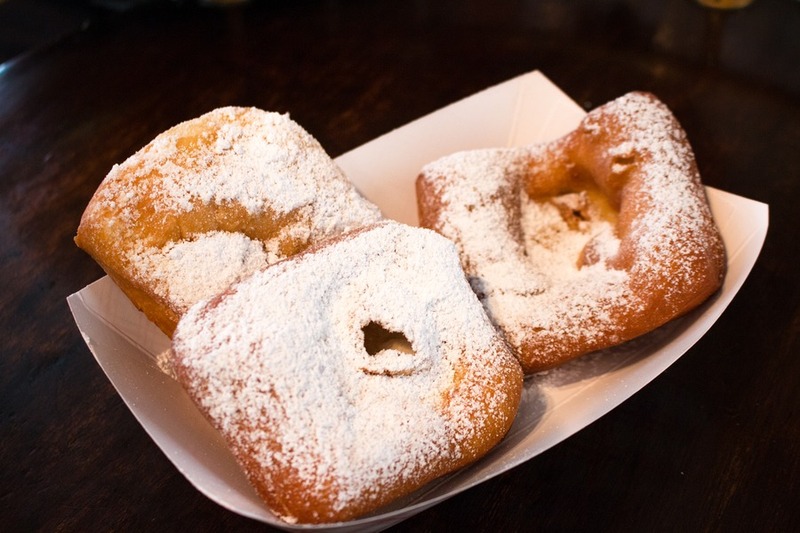 We couldn’t say no another round of fluffy, sweet beignets from Café Beignet. The crispy dough and all-over-your-face icing sugar was my siren on the shores of Royal Street. 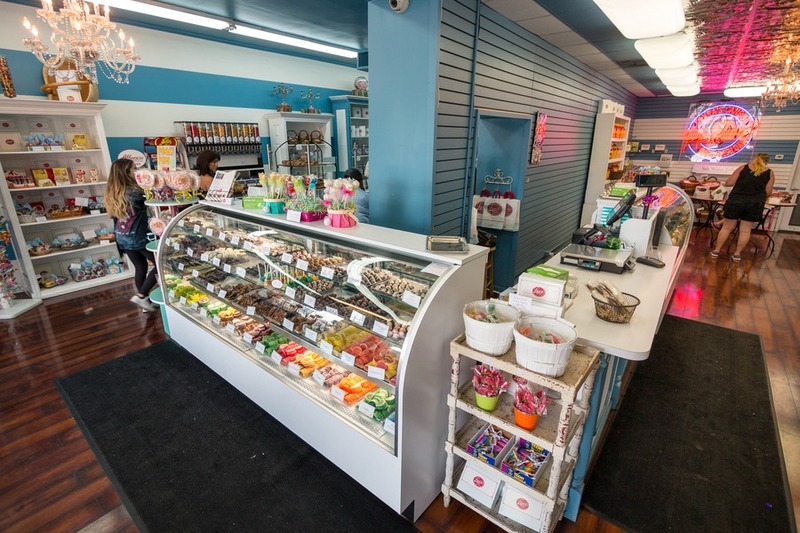 Once we scratched that itch, we were ready to see what new treats New Orleans could dish up. 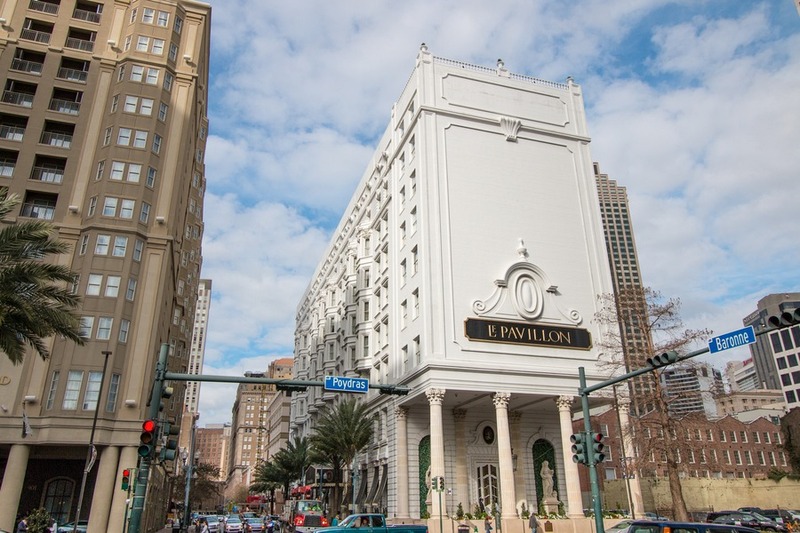 While in New Orleans we stayed at Le Pavillon, teeming with old world charm and the best of modern conveniences. 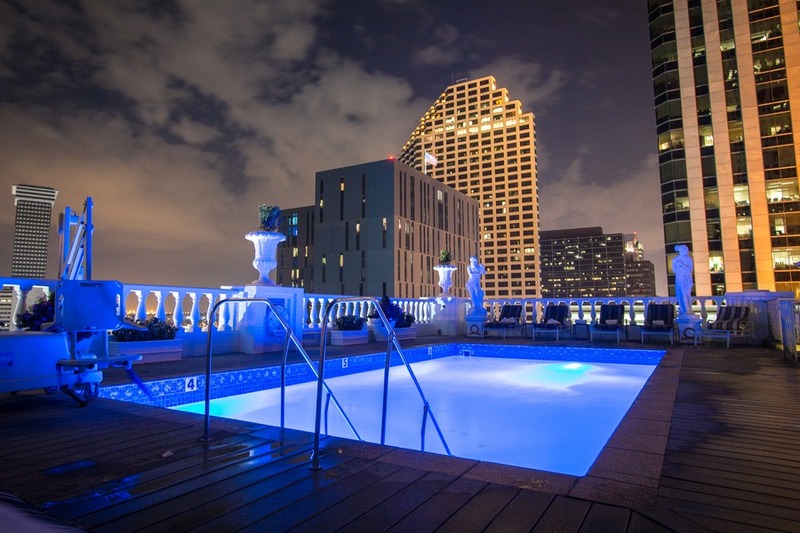 Oh, and the best roof-top pool in the city. This award-winning seafood restaurant was packed… and we visited on a Monday night! 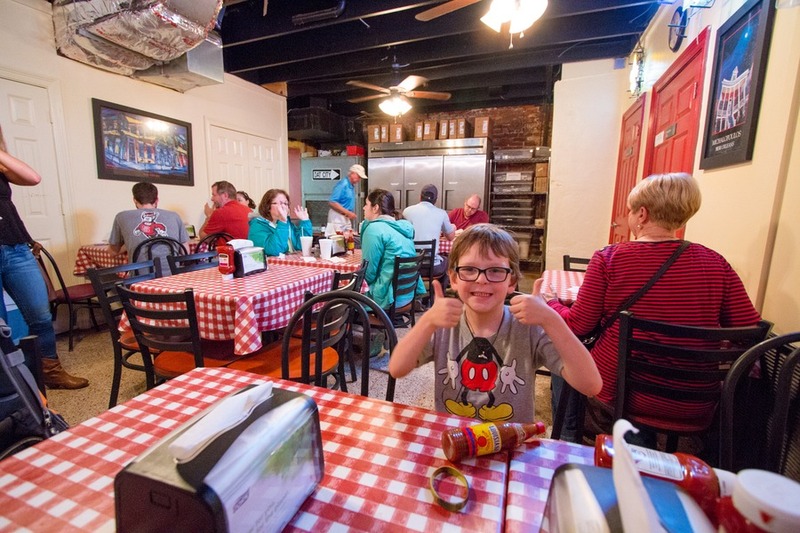 This area used to be the dark, unsavoury gateway to the French Quarter, but these days being only one block back from Canal Street, it was an easy and convenient spot to enjoy a family-friendly dinner. One that I’ll never forget. I have to explain. Our family typically doesn’t do seafood (although we’ve made valiant efforts in Finland and Greece). None of us consider ourselves lovers of anything that comes from the sea (aside from my daughter’s obsession with canned tuna). So when our jubilant waiter discovered we all planned on ordering chicken, he was outraged. Ike is one of the main reasons you have to visit the Red Fish Grill. He has been working there for over 9 years and I insist you request to be seated in his area. Part entertainer, part waiter, 100% hilarious, he made our night an absolute winner. He was funny, encouraging and beyond helpful. Unsurprisingly he’s won waiter of the year award and regularly gets mentioned in reviews on TripAdvisor. Even an Australian can’t help but give him a generous tip. I’m always a fan of restaurants which serve a complimentary starter. And even though tuna tartar was not my ideal, I tried it and it was okay. I can’t say I’m a fan of raw tuna but Josh devoured all of our leftovers and nothing went to waste. The signature appetiser was fried BBQ oysters, which we were originally steering clear of and Ike would not hear it. We had to try it. Out it came in the shells, fried and topped with blue cheese. One, two, gulp. Hang on, that was delicious. To be honest I couldn’t even taste the oyster, since it was fried and the bold blue cheese flavour covered the slimy creature hiding in the shell. And that was perfect for me. Consider me a convert. Oh, we also had succulent alligator balls, also known as Boudin Balls, a Louisiana delicacy. Bread came out hot and crunchy in a cute paper bag. I loved that and soon found this was how it was served in several restaurants around New Orleans. My son decided to skip the bread and eat the butter instead. Parenting win. By the time the main meal arrived I was full. How disappointing. My Creole jambalaya risotto cried. 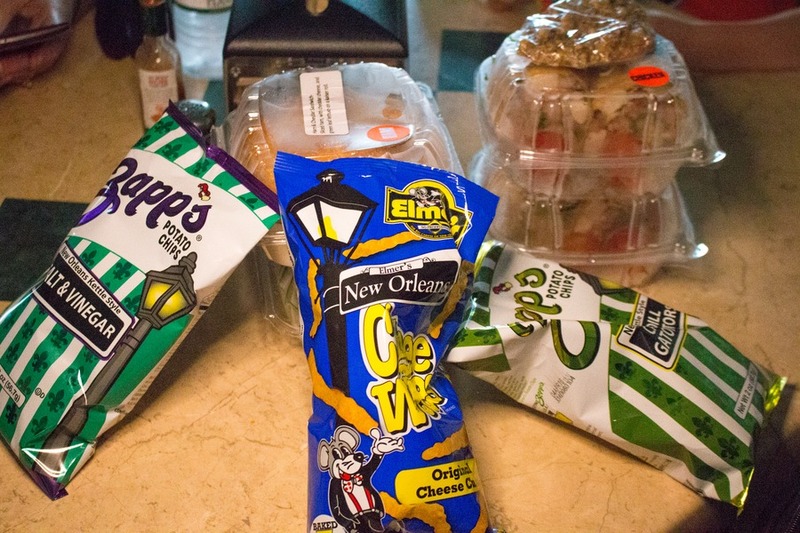 I did try a few mouthfuls and it was everything I remembered about New Orleans. Charming, bold, flavoursome, delicious. There was no way I was leaving that behind and the leftovers were sufficient for 2 more meals over subsequent days. Now that’s a big serve! Josh chose the legendary wood-grilled redfish & lump crabmeat, and was licking his lips. The fish was so soft and succulent. 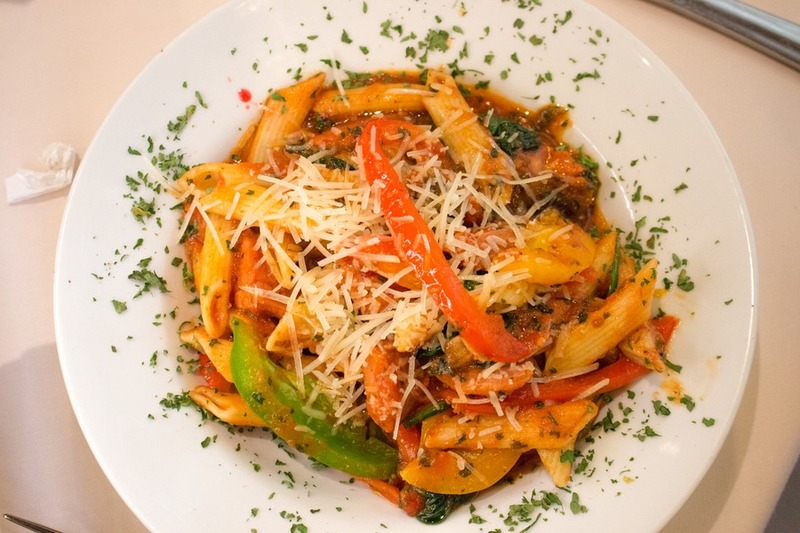 We could see why this was one of the restaurant’s most popular dishes. They have a kids’ menu, so Mia opted for a burger, while Caius enjoyed fried shrimp (which I told him was popcorn chicken!). Their meals also came with a soft drink/juice and a bowl of ice cream loaded with sprinkles. Mia had recently been watching a cooking show and was mesmerised by the flambé technique so she couldn’t resist the mouth-watering banana fosters flambé. Our waiter brought the banana fosters to the table, lit up his fry pan of alcohol and poured the flaming liquid over our ice-cream cake, much to the delight of our kids. Even though I couldn’t fit another bite, Ike asserted we had to try the double chocolate bread pudding. The bread pudding takes 20 minutes to prepare so it has to be ordered at the same time as the meal. How could I describe it? This dessert was like a chocolate muffin married a delicate soufflé - absolutely divine. 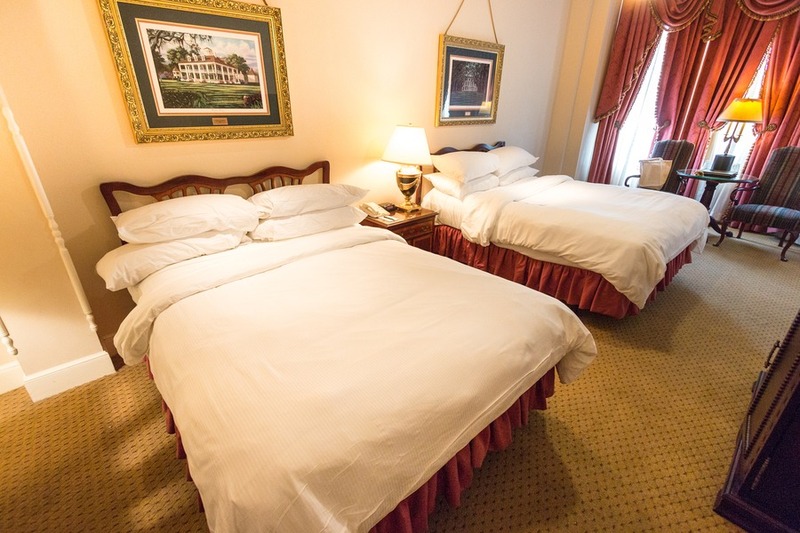 It’s regularly rated as the best on Bourbon Street and top 5 in New Orleans. Josh hailed it the king of bread puddings. We ate far too much, but held no regrets. 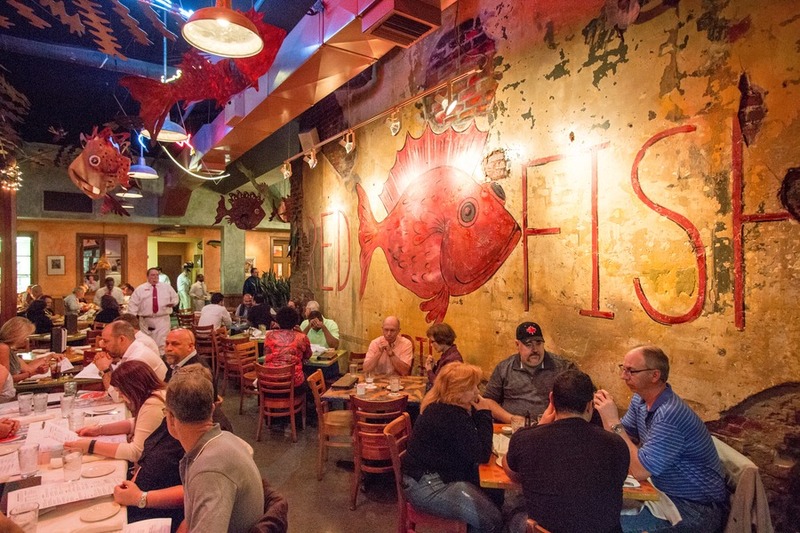 Red Fish Grill was the culinary highlight of our New Orleans visit. Once Ike has spoiled you, every other dining experience will be measured against this place. You’ve been warned. During our stay at Le Pavillon we couldn’t help but notice the glittering Crystal Room near the lobby. This restaurant serves award-winning French cuisine with a generous dose of Louisiana inspiration. We decided to visit once for breakfast and once for lunch. 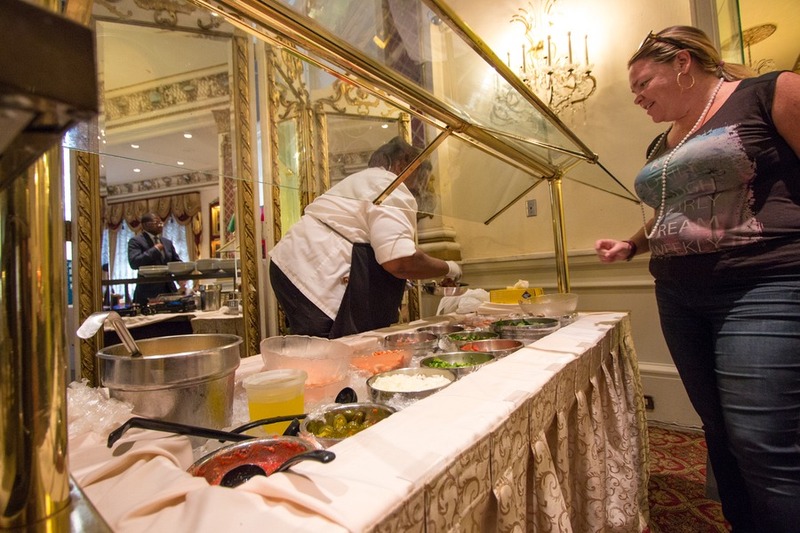 The highlight of both meals was Miss Patty Cakes who at breakfast operated the egg station and at lunch the pasta station. She was full of life and southern charm with “honey”, “darlin’” and “love” effortlessly flowing in every conversation. 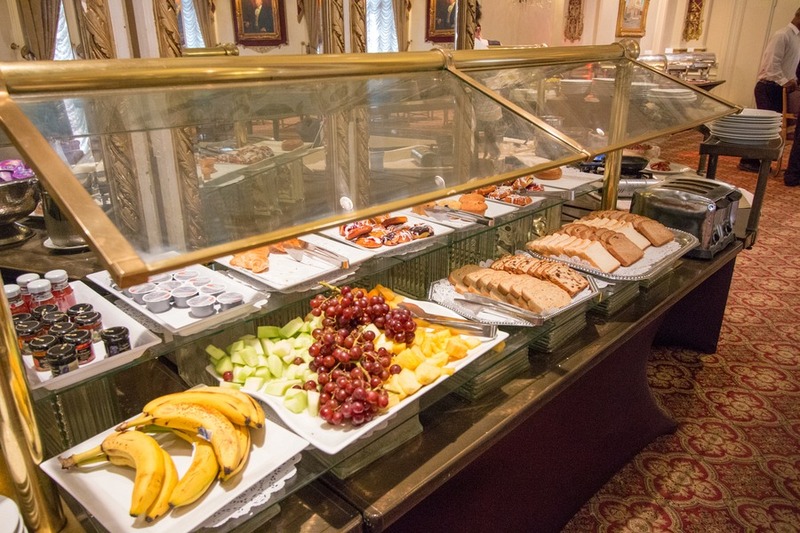 Breakfast was a buffet with bacon, biscuits, sausage, pastries, cereal, etc. And Miss Patty Cakes on the egg station cooking up any omelette, fried egg or scrambled eggs you like. You simply choose the ingredients, she cooks it up and has it delivered to your table. My omelette was delicious! Lunch consisted of a salad buffet and several hot dishes, including a chicken and Andouille sausage gumbo. 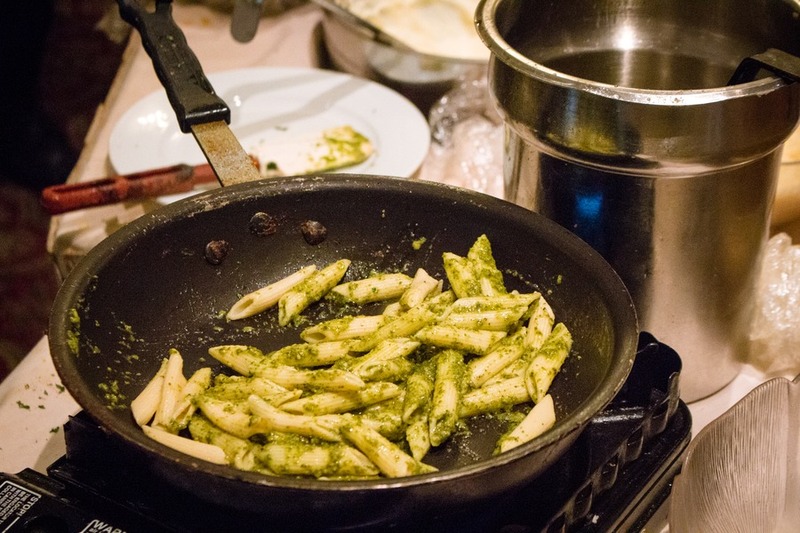 But again we couldn’t resist delightful Miss Patty Cakes who cooked us up a make-your-own pasta. 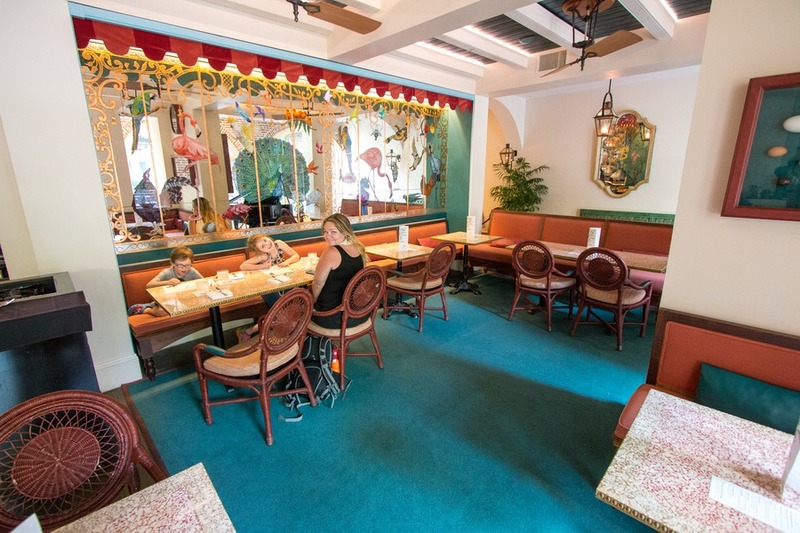 The décor declares fine dining, but the staff are so friendly and warm you feel right at home with and we had no worries with the kids being there. 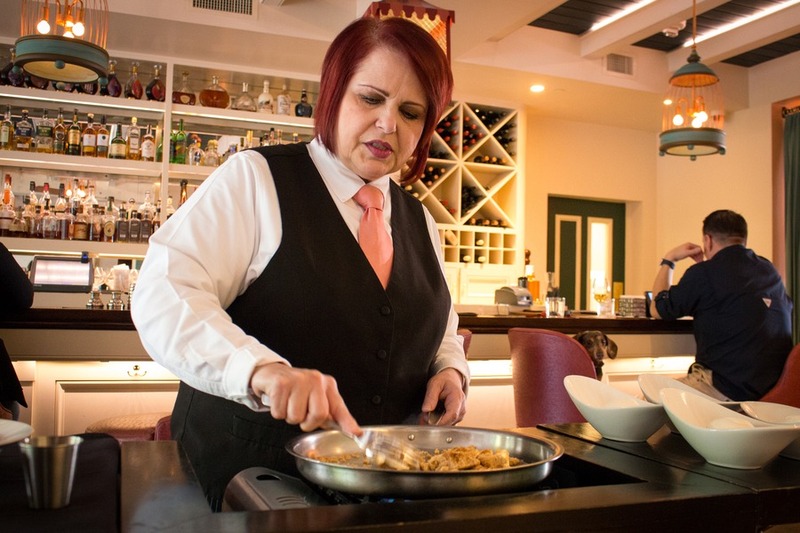 At the gateway to the legendary French Quarter sits this Parisian-style restaurant serving contemporary Creole. We had a fascinating view of Canal Street through large windows, the perfect spot for people watching. Once again a complimentary starter was presented, which quite possibly was one of the yummiest things I had eaten in many moons. Tender duck confit on puff pastry with a secret sweet sauce drizzled on top. It was so good I demolished Mia’s and Caius’ servings as well. And didn’t regret it one bit. The Palace prides themselves on their prosciutto so we took their recommendation and tried the Petite Campagne - an antipasto platter served with prosciutto, lamb terrine, venison salami, duck rillettes, olives and pickled vegetables. They were right - the prosciutto and salami were extremely tasty with a savoury tang that sat on the palate like a brilliant lingering sunset. After such a wonderful start my expectations were high for the mains, and unfortunately my dish didn’t quite reach. I ordered the Creole seasoned filet which included cauliflower puree and deep fried macaroni and cheese. Brown on brown. 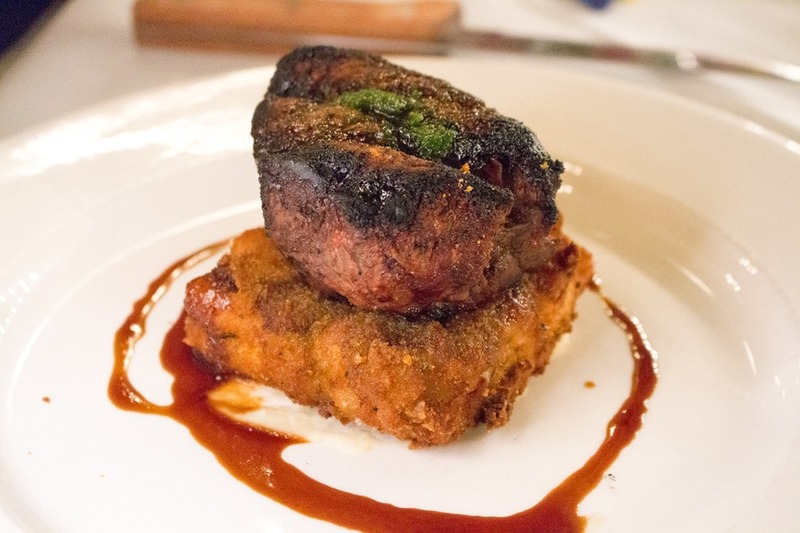 There was a drop of cauliflower puree hiding under a cake-like fried macaroni & cheese, and a steak sitting on top. I ended up ordering a side of roasted vegetables to have with the meal and skipping the soggy breadcrumbed mac and cheese. My son got the kids version from the kids’ menu and our dishes looked identical. Mia had angel hair pasta, which was overcooked, sticking together. But she seemed to enjoy it. Josh ordered the Andouille crusted fish on the recommendation of the manager, Dan, and scored a winner. 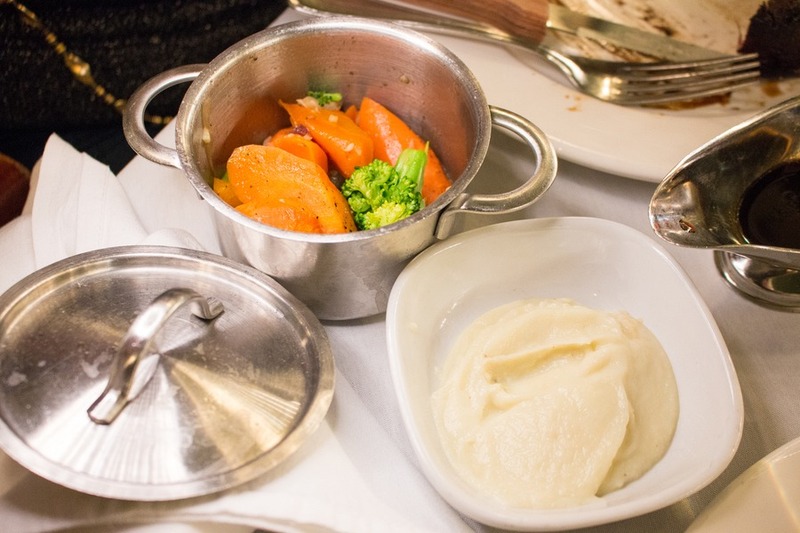 It really was as scrumptious as it looks – tender, juicy and a smooth, distinguished flavour. A great pick. When we found out the dessert chef had worked in the restaurant for 24 years I knew we had to save room for sweets. All the ice cream and sorbet is made in-house, but we went with the white chocolate bread pudding and the vanilla bean crème brulee. Both instant winners with unanimous thumbs up all round. During our meal we were privy to all the people sitting in the outdoor area in front of our window. During the night a dishevelled gentleman took a seat and studied the menu. He then ordered and proceeded to talk to the air and anyone else that came within range. The staff were apprehensive, but delivered him a ceaser salad and water as requested. Soon after, and perhaps only a quarter into the dish, he called the waiter. They had a discussion that we could not hear, but by watching the body language I could tell there was there was something wrong and he wanted it returned to the kitchen. The same thing happened with his pasta entrée. Again it was only a quarter finished when one of the waiters were beckoned and it was sent back. It was clear this “free” meal had been the plan the entire time, and as it played out before my eyes I had to wander what the staff would do about it. To my surprise the manager came out to talk to the man. He was very warm and smiling and gave him a bag of bread. I assumed he was politely encouraged to find a dinner to his liking elsewhere, because the man got up and departed. Upon talking to the staff at the end of the night it was clear that the situation had happened previously and they were all aware of how it was going to go down, but none of the staff were rude or disrespectful in their dealings. Remarkable. It did make me wonder about this challenge for restaurants. In Australia we still fill our car up with fuel and then pay for it, while here in the US nearly every gas station we have been to has required pre-payment. Is there a possibility upscale restaurants will turn to this in the future? Will that detract from our dining experiences? Or will it continue to be built into the cost of doing business? Either way I’m not enviable of those longsuffering staff members – I know I wouldn’t have their composure. I take my hat off to them. 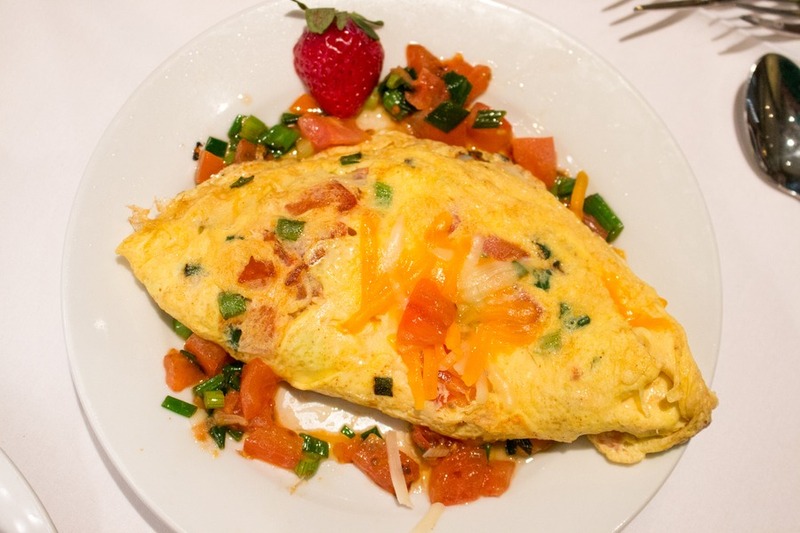 Right across the road from Café Beignet is Brennan’s, a glamorous and decadent old-world dining experience. This is the site of the original Brennan’s opened in 1946 which has been completely renovated. The gorgeous New Orleans architecture and ambiance had me oohing and aahing as soon as I entered. 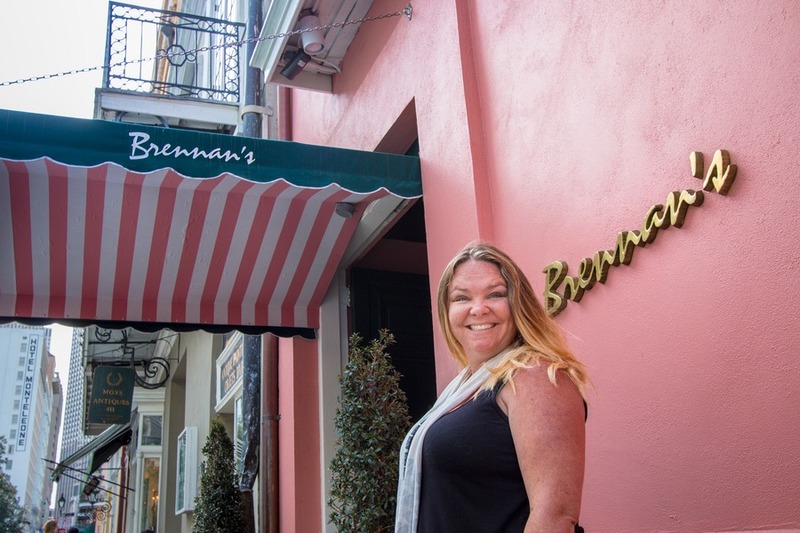 Brennan’s prides itself in it’s Creole traditions bolstered with contemporary New Orleans influences. Classic and modern techniques married in divine originality. The décor provided a sophisticated backdrop for the impeccable service we received at this high-end dining experience. We arrived late one afternoon to try the famous Bananas Foster, conceived and nurtured in this very building. The story goes a shipment of bananas was stuck in New Orleans in 1951 and. with nothing else to do with them. Laura Brennan dictated a special type of dessert to her chef. Originally not served with ice cream, she declared that would be the final piece of the puzzle since “Americans loved ice-cream”. It’s been a cultural fixture ever since. A waitress came to our table wheeling a small cart. In front of us she sautéed bananas in butter, brown sugar and cinnamon. The kids’ favourite moment occurred when rum was added to the pan and ignited. 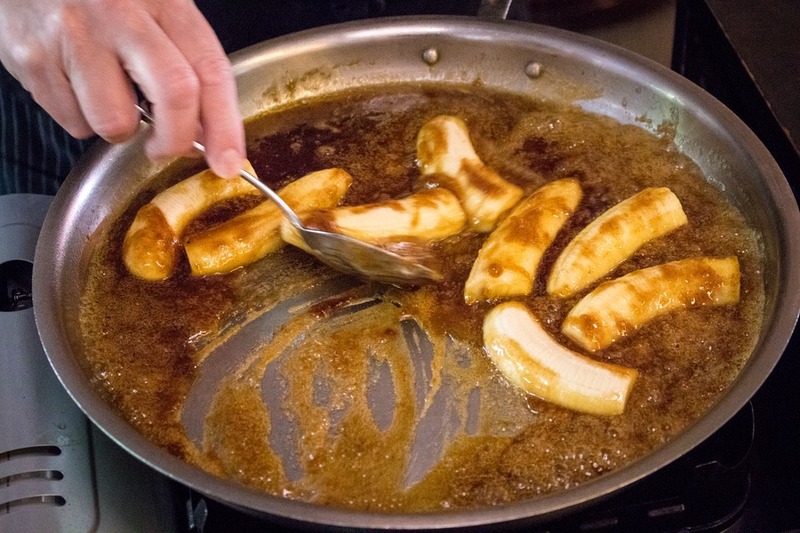 The alcohol was quickly burned off, leaving a sweet caramel-soaked banana. Delicately placed in a bowl, hugging a decadent vanilla ice cream, the remaining caramel sauce was drizzled on top. Heaven in a bowl, literally. You can’t come to New Orleans without visiting this culinary institution. 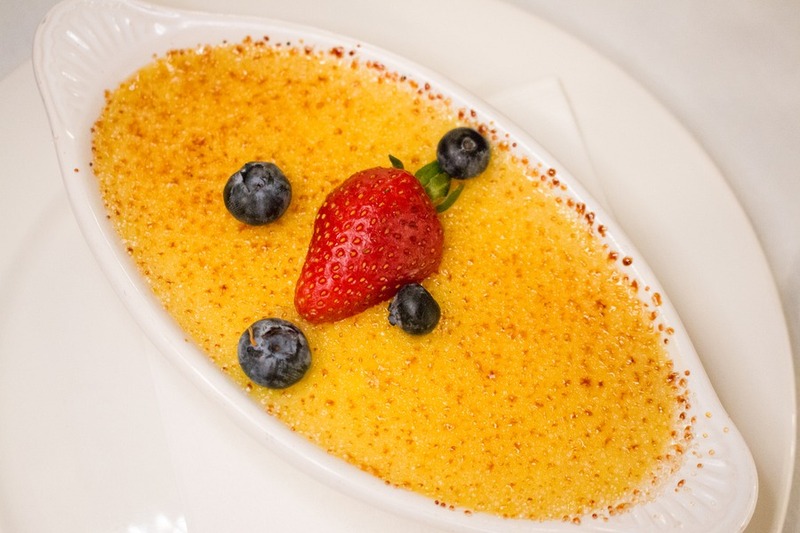 It’s almost like a Graceland experience for dessert lovers. Josh fell in love with po-boys on our last trip to New Orleans. After visiting establishments like Mothers it was hard not to. 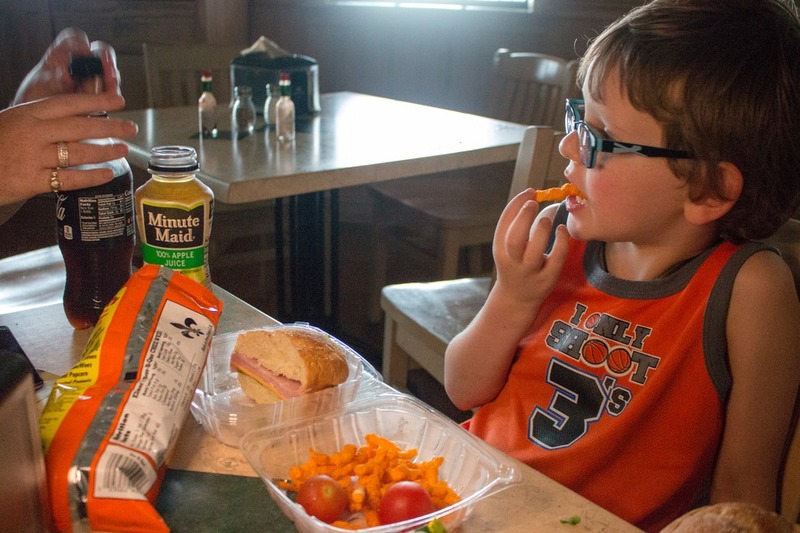 So we were excited to try more iconic po-boy eateries. Po-boys have a history dating back to 1929 when two brothers started serving sub-like sandwiches to streetcar union workers on strike. 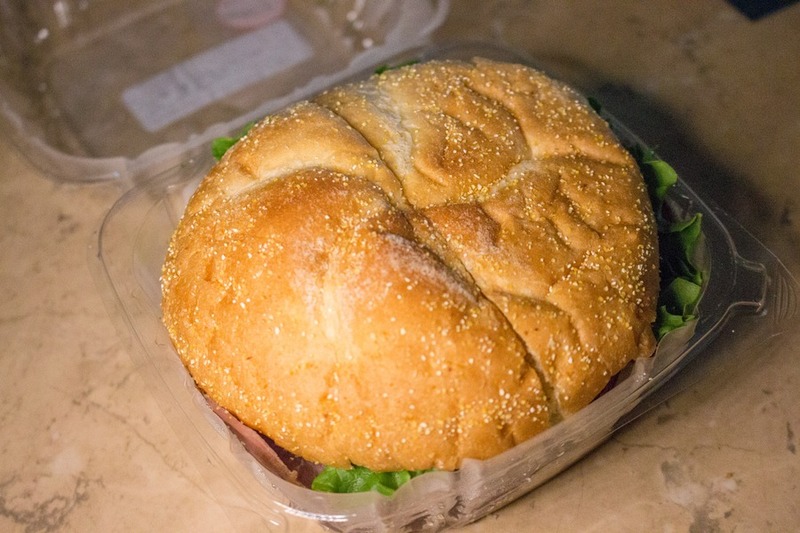 The sandwiches were made of one pound loaves of French Bread cut into three and filled with ham, cheese, lettuce, tomatoes, pickles and mayo. These sandwiches were fed to the men free of charge. As the men came into the restaurant, they would say “Here comes another ‘poor boy’ man.” And so, the po-boy became a part of New Orleans’ culinary identity. 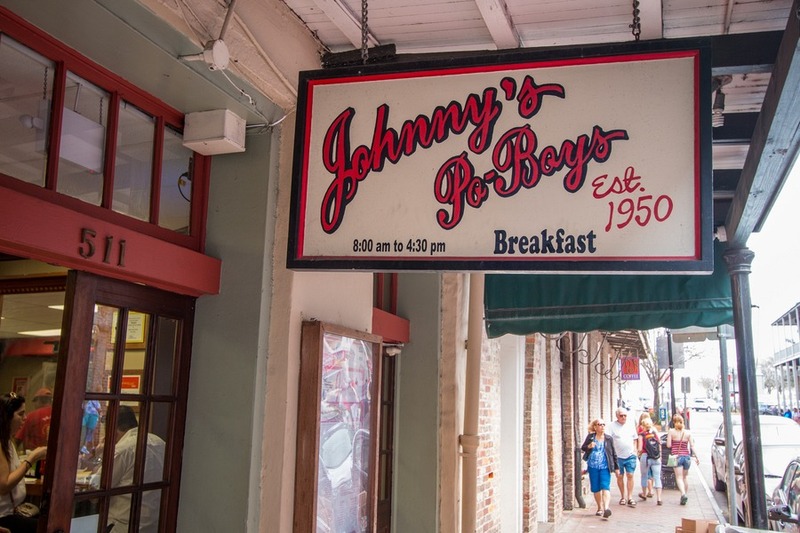 Johnny’s is the oldest family-owned po-boy restaurant in New Orleans and one of the first eateries to re-open after the devastation of Hurricane Katrina. A simple shop with seating in the front and the back, you simply place your order at the cashier, pay, wait, then be seated. If you’re asked do you want your po-boy “dressed,” it means served with lettuce, tomatoes, pickles and mayonnaise. We went with staff recommendations on the Johnny’s Special of roast beef, ham and cheese. Also another plain roast beef with a side of Creole rice and beans for the kids. Let me tell you something, if you aren’t getting your hands dirty then you’re not doing it right. These things are messy, but they are also crazy delicious. The Johnny’s Special was a firm favourite, while our kids demolished the rice and beans without coming up for air. 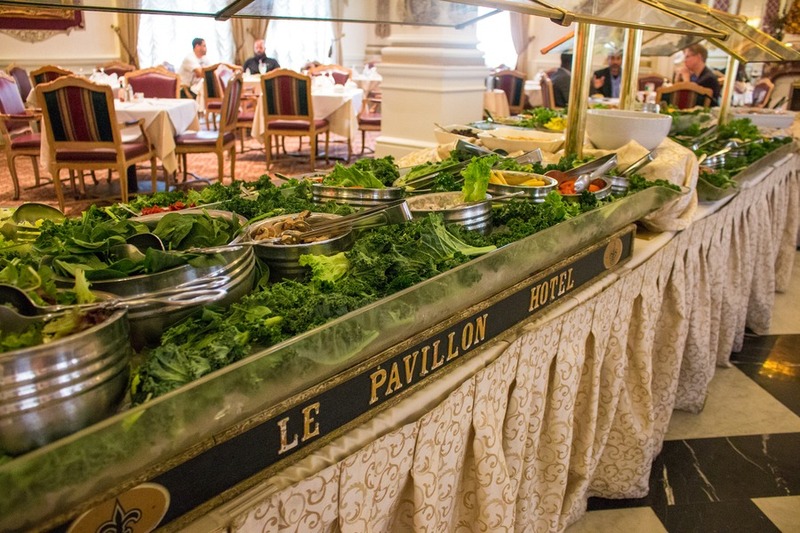 We were all set for a delicious Southern Cajun/Creole creation from the Oak Alley Restaurant. It’s housed in a 19th century cottage located on the grounds by the antebellum mansion. But after our car broke down we had to reschedule for the following day, which happened to coincide with a flood warning and a power outage. Sadly the restaurant was closed when we arrived due to a lack of power, but the café was still serving pre-prepared food so we settled down to eat in the dark. After all the amazingly rich food New Orleans had to offer it was actually quite nice to eat a simple chicken wrap and a bag of Louisiana chips (crisps). And a small serving of praline to top it all off. 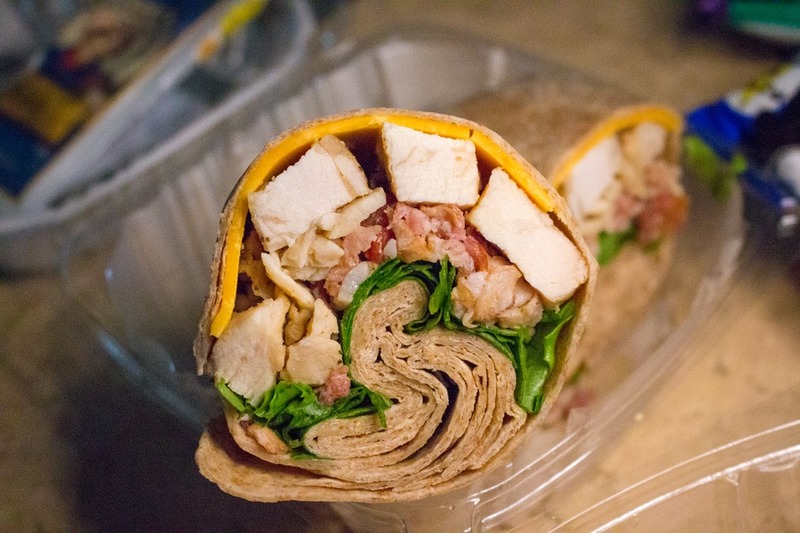 The wraps and sandwiches were soft, fresh and the perfect meal to ensure we saved room for another big New Orleans dinner later that night. Next time though I’m heading to the restaurant. Plus, I never get tired of seeing this gorgeous plantation, it’s positively stunning. 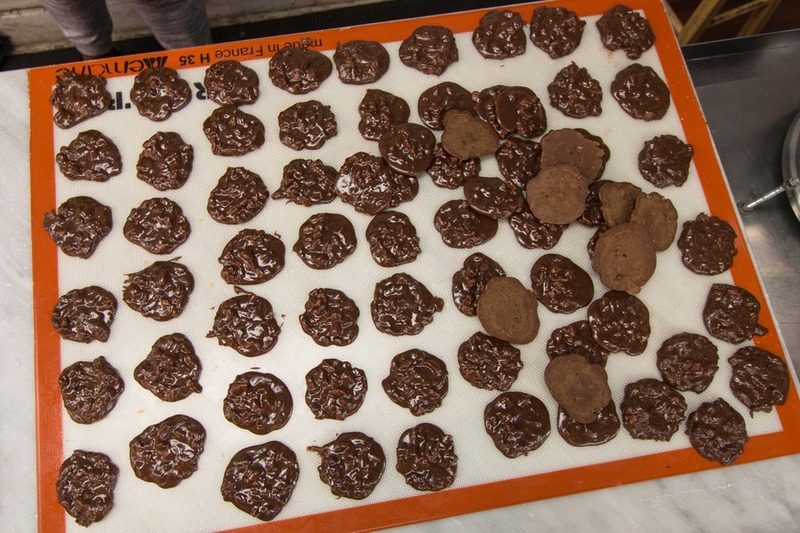 The Praline Connection began as a home delivery service targeting career women who were too busy to prepare home cooked meals for their families. 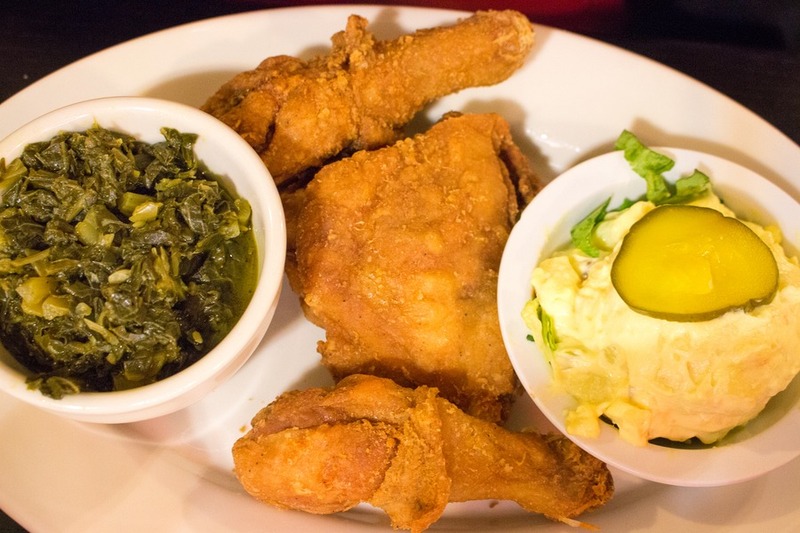 Now their restaurants serve home cooked style soul food with a Cajun-Creole influence and a reasonable price to match. This restaurant was possibly my least favourite in New Orleans. Trying to eat a little more healthily, with less carbs, I didn’t find much that suited what I was after. The staff were not as warm as the other restaurants we had visited and seemed run off their feet. Still, the restaurant was packed and people were waiting for tables. The deep-fried southern dishes were on target. 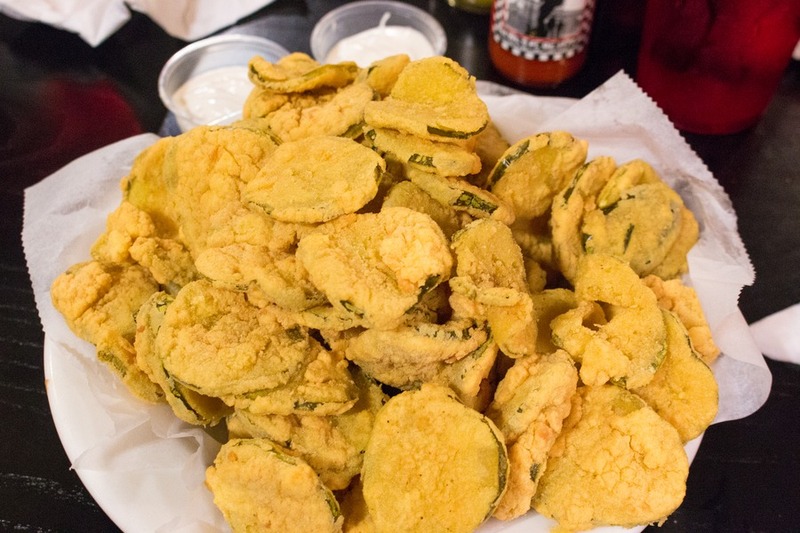 We started with a bowl of overflowing fried pickles and this serving was enough to feed, well, probably 2 families. We barely made a dent in the massive pile. I found the batter a little soft and it wasn’t the best southern fried pickles I’ve eaten. Each dish comes with 2 sides so Josh ordered BBQ ribs with beans and macaroni and cheese while I went with fried chicken with collard greens and potato salad. The kids were happy with their usual rice and beans. Josh’s ribs could have been a little more tender and meaty, but he raved about the sauce. It was one of the best sauces he’s ever had and we’ve eaten BBQ in Nashville so that’s a big endorsement. My fried chicken was crispy on the outside and deliciously tender on the inside. I enjoyed it, but could not complete any of the sides. Collard greens are still so foreign to me but Josh was happy to take on my potato salad since the kids had commandeered his beans as well as their own. 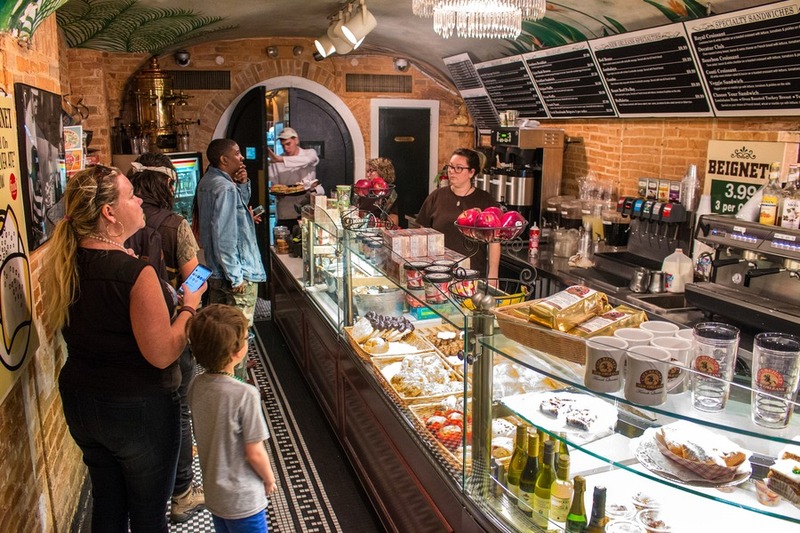 As the oldest candy store in New Orleans, Laura’s has been serving world-famous pralines and delicious truffles since 1913. We went in and discovered a multitude of free samples to try. The Cajun white chocolate praline was interesting, while my favourite had to be the coconut praline. Go in and try. 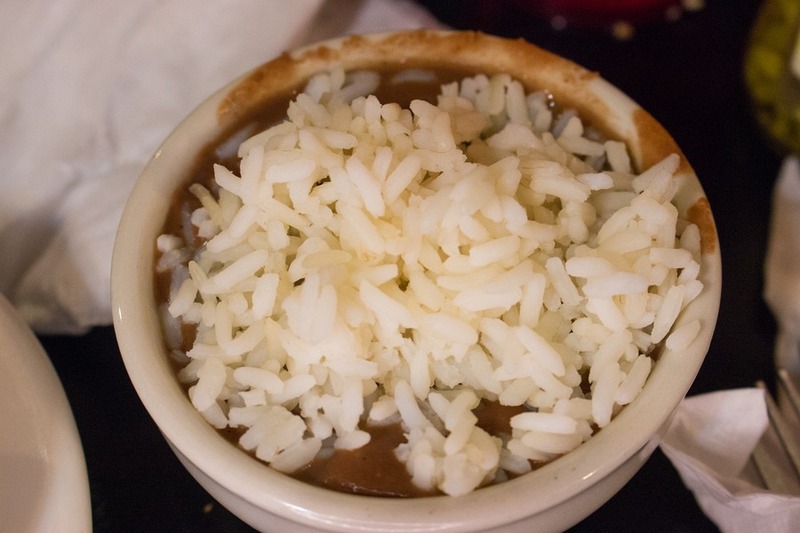 It was the best I’d sampled in New Orleans (and we tried a few!). I dare you to leave without buying. It’s impossible! It’s confirmed. There’s no rose coloured glasses in New Orleans. Everything was as delicious as I remembered… and more. Fluffy beignets, messy po-boys, fiery jambalaya, and desserts to die for. But I’m so glad we pushed against our comfort zone and tried new dishes that we might not have otherwise. It helps to be adventurous in New Orleans. Especially when it comes to food. 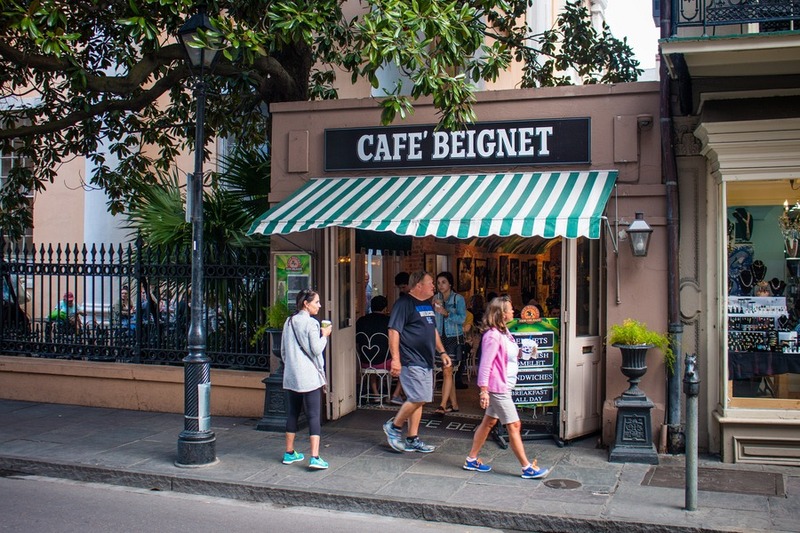 Between the Creole and Cajun flavours, warm southern hospitality, generous portion sizes, and a deep, soulful respect for food, The Big Easy easily captures the imagination and tastebuds with a commanding grip. Every devoted food lover must make a sacred pilgrimage to one of America’s best food cities. All you need is your hunger. Actually, make that a double. Great recommendations! 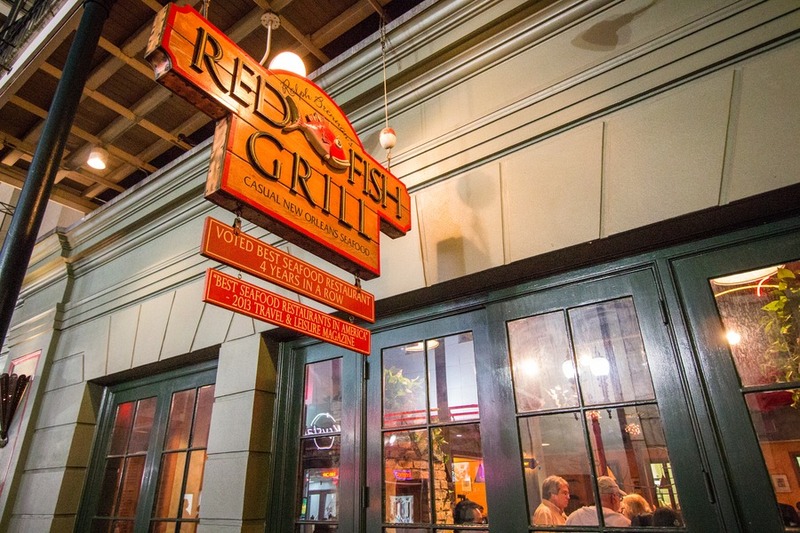 Seems like Red Fish Grill is the place I would like to have a dinner at! Good food and such a nice atmosphere! Amazing post with good images. All of those food dishes look amazing! I know I'll need to be very careful travelling to the USA, the opportunity to put on so much weight is so easy. Especially with delicious food like that! Nice post! thanks for the sharing..
What a delicious blog. HMMM. I'm craving. Thanks for sharing. Please keep on blogging. Thank you.